LANCASTER – A woman was killed in Lancaster Sunday afternoon and a family member was detained in connection with the death, authorities said. It was reported around 2:03 p.m. Sunday, April 14, in the 45300 block of 7th Street East, according to a news release from the Sheriff’s Information Bureau said. “Deputies assigned to Lancaster station responded to the location regarding a ‘person down’ call. 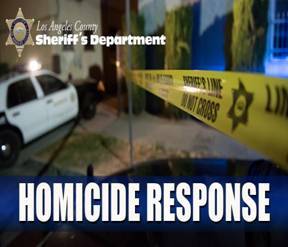 Upon their arrival, deputies located the victim who had suffered blunt force trauma to the upper torso. The victim was pronounced dead at the scene,” the news release states. The victim’s name has not yet been released pending next of kin notification. “A family member was detained at the scene pending an interview with homicide detectives,” the news release states. The relative’s name was not disclosed. The incident remains under investigation and no further information was immediately available. UPDATE: The victim’s daughter, 19-year-old Destiny Hammack, has been booked for murder and is being held in lieu of $2 million bail, LASD just announced. The victim’s name has not yet been released, but she was a 62-year-old black female, sheriff’s officials said. UPDATE: The victim has been identified as Diane Hammack, 62. 3 comments for "Woman killed in Lancaster, family member detained [updated]"
Are you sure it was not the uncle she is such a sweet child. This does not seem right. Av is wheelin and Killen.. Beware all. Destiny’s destiny is a California prison cell.